Posters have always been in trend, whether it is the movie posters or the amazing rock posters. But during the early 60’s there was a huge trend of rock posters of different bands and rock artists. People used to go crazy with the attractive and cool rock posters that were available in the market at cheap prices. Designing such posters was quite tough, as it required the state of art, technique and the style to come up with an interesting idea. You could find these posters on all popular spots like bus stops, telephone poles, bulletin boards and other important places. Again, the cool rock posters are in high demand and it is owing to their value and importance. Here are a few reasons why rock posters are so valuable. According to the historians, cool rock posters have a great value, as they were the significance during the social movement of the 20th century. As compared to the other collectibles, such form of art helped in shaping the nation. That is why these rock posters are considered to be so important and valued for the interesting ideas behind them. There is a huge demand of rock posters all over the work. Fans of music are looking for these rare collections and that this why they have recently become very popular among the people. Not only the fans but also even art lovers want to include them in their collection. The collectors from America are also looking for this rare stuff, which have a lot of historical value. It is because of the simple reason that no other collectible is able to represent the era of the 1960’s, just like the cool rock posters. Designing posters is an art, which is quite difficult to expertise. Many major museums like The San Francisco Museum of Modern Art, The Laguna Art Museum, the Whitney Museum of American Art etc. have organized a number of exhibitions and focusing more on the rock posters. The main motive of these exhibitions was to let the people know about this Psychedelic Art and create awareness about it. Thus, it is a good medium to explore rare and beautiful things at one platform. Cool rock posters are defined by bold colors and a unique message, which every poster depicts. It is a great way to convey your message about the event that will be organized. Even the most popular event promoters like Late Bill Graham are of the view that music is an art and therefore these posters are a fine promotional tool. 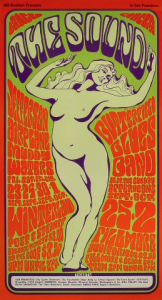 In the 1960’s, cool rock posters were used for promoting different kinds of events. These posters were pasted on poles, walls and bus stops and as soon as the event was over, it was replaced with a new poster. The only people who were fond of these posters were teenagers who were attracted towards these amazingly designed cool rock posters. At that time, less attention was given to preserving the collectibles and therefore only a few rare collections is available now.